The purpose of being a follower of Jesus isn’t to become filled with head knowledge and have no application. Jesus intended for us to step into our identity and live it out. It’s a tricky road when you start talking about living like Jesus. The WWJD bracelets and mantra “what would Jesus do?” can be a catalyst for legalism. It’s not a bad thing to think about what Jesus would do, however, if I begin to rely on my efforts to be like Jesus there lies the problem. We are saved by faith and it’s dangerous to rely on ourselves. It fuels a belief that if I keep the rules, then I will be like Jesus. The truth is the Holy Spirit in us enables us to live like Jesus. You take Him out of the equation and you have modern day Pharisees; keeping the law without abiding in a Savior. Let’s read what Jesus had to say in John 14:9-21. We pick up where Thomas asked Jesus where He is going and Phillip asked to see the Father. Jesus told the disciples He was going away (speaking of His death and resurrection). I recommend reading and studying the entire chapter. There are people who try to be like Jesus without the Holy Spirit, by human will. It’s like trying to drive a car without the engine. You can have the manual and a map (God’s Word), but without the engine (the Holy Spirit) you won’t get very far. If we could do what God said without Him, we would have no need for a Savior. We need His Spirit to live a holy life and to fully understand His Word (the Bible). There are people using the Bible as a tool to destroy others because the revelation is not filtered through the Holy Spirit. The Bible can help or hurt depending on who is using it. The devil used scripture when he tempted Jesus in the wilderness (Matt 4). God comes to change our identity. He doesn’t enter our lives to make us better people who can keep the rules. He comes to crucify the old man and resurrect us into a new creation (Romans 6:6). We cannot live like Jesus without accepting Him as Savior. Yes, we may have some good traits, but only God in us can fully imitate Jesus. 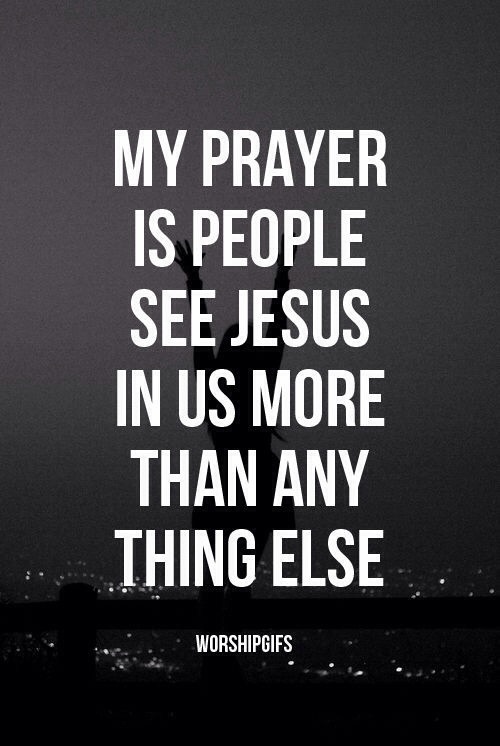 It’s His power in us transforming us from the inside out. Being (Identity in Christ) leads to doing (Living like Jesus). If you get them out of order, it leads to self reliance instead of God reliance. Obedience is never optional for the believer. God doesn’t give us a pass that says, “Pick what you want to do, and l give you permission to ditch what you don’t like.” God gives us His Spirit so our desires change, our nature is transformed (sanctification), and we are empowered to do His will. Yes, even with the Holy Spirit living in us we will find there are things God tells us to do that we don’t want to do. In those moments, we are able to cry out to Jesus for help. God responds to our cries for help. He forgives us when we repent. He cleanses us from our sins. He empowers us to turn from sin. God doesn’t love us based on our behavior. He is love, and God’s love is unconditional. No one expects a toddler to drive a car. God knows our hearts, our maturity level, our weaknesses, and how to grow us up in Him. Life with Him isn’t supposed to performance based. The Bible is filled with people who have failed. I’ve failed at many things, and I’m sure you have to. We are humans relying on an amazing God. God longs to help us live like Him, not demand we imitate Him without His help. He wants to live through us! He asks us to seek Him first; receive His love, wisdom, insight, peace and power! He gave us His Spirit! The most powerful Being in the Universe resides in born again believers. Our role is to let God live through us. Father, help us to rely on You and not ourselves. Help us to allow the Holy Spirit to live in us and through us. Help us to cease performing, relying on our efforts or human intellect, and help us to abide in You! May we seek first Your face. May those who encounter us, encounter Jesus! Thank you for our new life in You. Amen.